This is the first of a three-part series of reviews on demo rides of the current 2014 Indian motorcycles. Before we get too far along, I’m having a hard time wrapping my head around the idea that the new Indian motorcycles should be linked with the Indian motorcycles of the past. I know it gives the brand a lot of street cred to link it with a motorcycle that was built in the past. I got that! I know that this street cred is going to be crucial if they plan on going toe to toe with Harley-Davidson. Obviously they do plan on going toe to toe with them. I’m sorry but it just seems like a really weak ploy to try to do what Polaris is doing. But as far as I’m concerned this is a brand-new product which basically emulates some of the physical characteristics of the Indian motorcycles of the past. And I’m going to have to quote one of the people at one of the demo rides that I attended. He said ”you can paint feathers on anything but that doesn’t make it an Indian motorcycle.” With all of that said, I want to make sure that you, the reader, will understand that these are groundbreaking motorcycles. I personally would have accepted this motorcycle even though it wasn’t tied to the prior Indian motorcycles. I’m 55 years old which is probably the target age or around the target age for purchasers of these motorcycles. And I have no recollection of Indian motorcycles at all. I have no emotional ties to bridge the two products together. 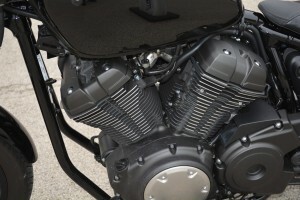 This review is on the Indian Chief Classic which is the base model of the three. It starts at approximately $19,000 which is in the ballpark of its competition. It might be on the high-end due to the fact that the motorcycle does not come with a removable windshields or any type of saddlebags. After you install the removable windshields and the saddlebags you could add easily $2000 more to the cost of the motorcycle. Obviously this excludes any labor for the installation. This motorcycle is a very well-engineered piece of machinery which will make it very competitive in its market segment. The fit and finish plus the little details will set it apart from the other competing motorcycles. The one thing of the many that caught my eye was the oil dipstick handle. It was one of the coolest things I’ve seen on a motorcycle in a long time. You’re going to have to go to a dealer and see what I mean, consider it at homework assignment from coolcycledude. Well, right off the bat I’m going have to tell you that I’m in love with the engine of this motorcycle. The sound emanating from the exhaust system is a true siren song that signals the subconscious mind to build an emotional pathway of need in the brain. Yep, if you like V twin engines, you’re going to have to have one of these. Aesthetically, the engine is a piece of artwork to look at. This engine is loaded with all kinds of special bits to make sure you know the brand name of this motorcycle. Okay, I know what you’re thinking, it looks good and it sounds good, so what? Well, during one of my little demo rides that I have up on my YouTube channel, I refer to this engine during acceleration as a” tractor on steroids.” So what do I mean by the phase “tractor on steroids?” I mean that it will accelerate with purpose through the entire usable rpm range. I ran it up very close to the red line and it just kept providing me with usable power. I’m going to guess a lot of R&D went into this particular engine. The same engine is used in all three models. This motorcycle came equipped with ABS and cruise control. Which, if you think about it, are pretty cool features. I’m a big fan of ABS, but to be honest, I rarely use the cruise control on a motorcycle. The Indian Chief Classic was a very comfortable motorcycle to ride, I didn’t feel crowded or cramped. The seat is actually covered with leather as opposed to other materials that are used currently. The clutch had a very light pull. I’m not sure if the clutch is assisted by hydraulic activation. I didn’t see a reservoir on the clutch lever. Turn signals are self-canceling. I’m a big fan of self-canceling turn signals because I’m the guy who always forgets to cancel them. The seat height is somewhere around 26 inches off the ground. The engine did seem fairly compact between my legs. I had no problems putting my feet flat on the ground when the motorcycle was stopped. There was plenty of room on the floorboards to adjust my boots forward or backwards to get more comfortable. I believe the seat is also a little bit larger than normal, giving you the opportunity to move forward or backward on the seat. One thing that I did miss, which I’ve grown accustomed to, is toe-heal shifters. This motorcycle is also covered with chrome pieces from front to back. You can definitely notice the quality of the materials used in the construction. The speedometer which is nicely laid out on the center of the fuel tank which will provide you with rpm, gear position, cruise control status and the regular suspects for warning lights. There’s also a gas gauge forward on the tank on the left side of the speedometer. On the right side of the speedometer is the keyless start button. I don’t know if this confirms that I’m a lazy American, but I’m a big fan of keyless start systems on any vehicle. For instance, on my 2012 Harley-Davidson Softail Deluxe, I just walk up to the motorcycle, turn the knob on the center of the tank, and hit the start button. You pretty much have the same situation on the Indian Chief Classic. You walk up to the motorcycle with the key in close proximity, press the button on the upper right corner of the fuel tank, and then hit the start button on the right hand grip. This sequence brings the motorcycle’s engine to life. The frame geometry is such that I felt very comfortable pushing this motorcycle hard in and out of the turns. The only thing I had to watch out for was ground clearance due to the floorboards. Otherwise I felt quite confident pushing this motorcycle through the turns. The Indian Chief Classic tips the scale somewhere around 800 pounds with all the fluids. It didn’t seem particularly top-heavy during the times I had to use my legs to move around. I do have one concern, the distance from the top of the forks, where the handlebars are connected to the handgrips, which seems a little bit long. I have a feeling that this may cause a problem when you’re trying to make low speed tight turns with the motorcycle. 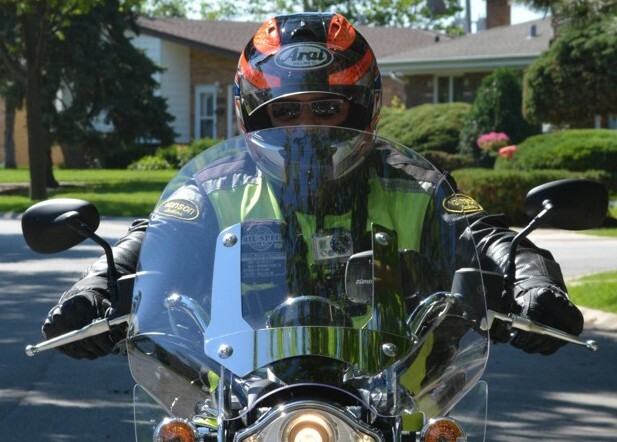 Unfortunately, during the demo ride, I didn’t have the opportunity to make tight turns with the motorcycle. So I can’t confirm whether or not this is going to be a problem. I guess you’ll have to ride the motorcycle for yourself and determine if it’s a problem for you. This motorcycle is equipped with three disc brakes connected to chromed wheels with spokes. Whitewall tires are included on this motorcycle. Nice oversized fenders cover the whole package front and rear. On the front of the front fender is a small little light which is shaped as the head of a chief Indian. I personally could go without it, it just seems a little bit of an oddity for me. But I guess it’s part of the whole Indian motorcycles of the past Mojo. If you’re in the market for a large cc V twin cruiser, I would definitely go to the nearest Indian dealer in inquire about a test ride.